Need a florist to send gorgeous flowers from the USA to Sydney, Australia? Pure Flowers is here to help! We deliver beautiful blooms from our award-winning florist anywhere in Sydney. Place your order by 11am weekdays and 9am Saturdays for same day delivery. Order online or call our flower shop on + 612 9427 8214. Looking for a florist to send flowers to Sydney, Australia? We are here to help you order beautiful blooms from the USA. We choose the best florals from the Sydney Flower Market to create fabulous arrangements, bouquets and luxe boxes. 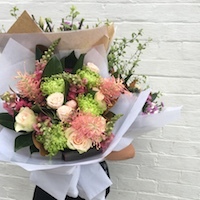 Whether its a birthday, a hello or sympathy, our courier will deliver your fresh flowers from our award-winning flower shop to the Sydney metro. For same day delivery, order your flowers by 11am weekdays and 9am Saturdays, Sydney time. Ordering is easy – call +612 9427 8214 or shop online. Pure Flowers has a wonderful range of flowers for you to choose from - amazing arrangements, luxury flower boxes and gift wrapped bouquets. Our talented team will create your special order in our store. We look forward to sending your message with flowers!